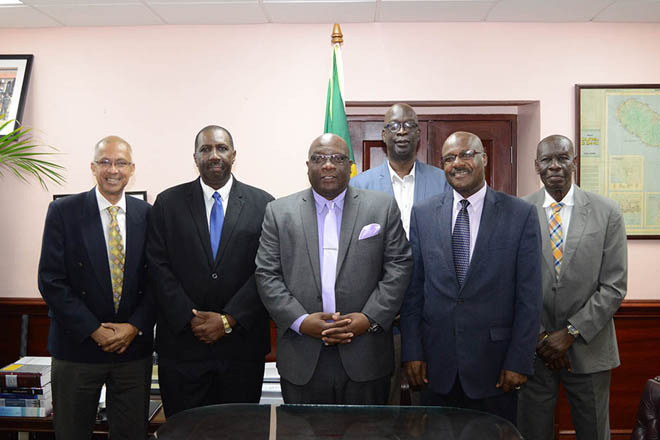 (Press Unit in the Office of the Prime Minister) – The new Executive Body of the Board of Directors of the Caribbean Confederation of Credit Unions (CCCU) has demonstrated its willingness to work closer with the Government of St. Kitts and Nevis in a number of areas that will redound to the benefit of the people of the Federation. This view was expressed on Thursday, July 13, when members of the Board met with Prime Minister and Minister of Finance, Dr. the Honourable Timothy Harris, during a courtesy call at Government Headquarters. Board members present during that meeting were President, Mr. Hally Haynes; Vice President, Mr. Joseph Remy; Secretary, Mr. Winston Fletcher; Treasurer, Mr. Lennox Bowman and General Manager, Mr. Ralph Wharton. Permanent Secretary in the Office of the Prime Minister, Mr. Andrew Skerritt supported Prime Minister Harris during the discussions. The officials deliberated on a wide range of issues including the state of the region’s financial and banking sector, regulatory framework in the region, the impact of de-risking and the withdrawal of correspondent banking relationships from Caribbean banks, as well as the issue of anti-money laundering/combating the financing of terrorism (AML/CFT). The Board members also updated Prime Minister Harris on plans for the construction of a new building to serve as the headquarters of the Caribbean Confederations of Credit Unions here in St. Kitts to the tune of over US$1 million. The CCCU has been headquartered in St. Kitts since 2002, after being relocated from Barbados. However, the current building that houses the financial institution is more than 70 years old and is in a state of disrepair. The Honourable Prime Minister Harris in turn expressed his appreciation to the Board on its decision to retain its headquarters in St. Kitts. “We are prepared as a Government to do what we can to ensure that the environment is the best one that you could have anywhere in the region. I want to say thank you for choosing St. Kitts and Nevis to play this very important role and we would hope and envisage that as a result of your presence here more could be done for the development of the cooperatives sector in St. Kitts and Nevis and by extension within the OECS region,” Dr. Harris continued. It is expected that the new facility will house the CCCU’S administrative offices, a credit union museum and conference facilities. The Caribbean Confederation of Credit Unions was established on August 17, 1972 in Dominica as the successor to the West Indies Conference of Credit Societies. It serves as the apex trade and development organization for credit unions and non-credit union co-operatives in the Caribbean.